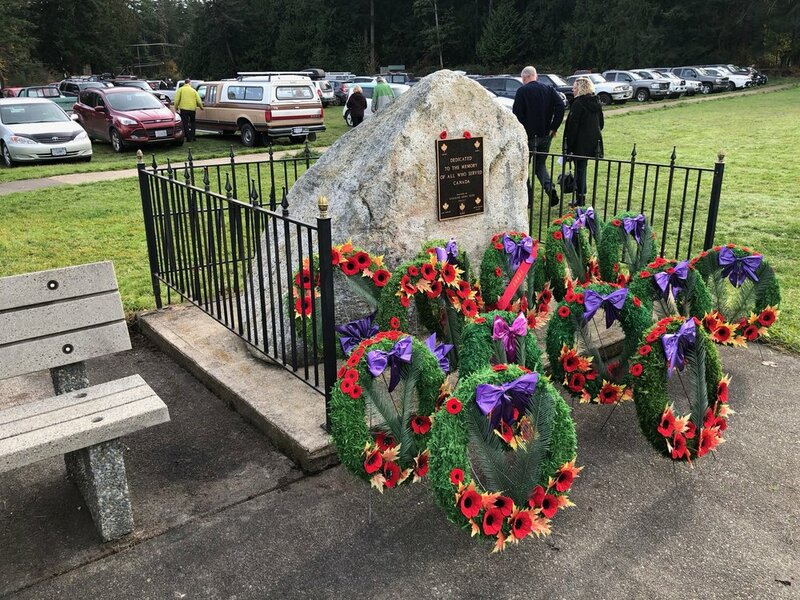 For Justine’s birthday, we spent the Remembrance Day long weekend on Galiano. We rented a small cabin right on the water, and spent the weekend working on the property (OK well not much), hiking, bird watching and generally enjoying ourselves. We also managed to finally get to Pilgrimme for Justine’s birthday dinner. Our little cottage by the light of day. We headed to the ferry on Friday evening, as the evening ferry only runs late during the winter. BY the time we got to the cottage I had found on AirBnB, it was close to 9:00 and very dark. We were right across the water from the ferry terminal, but with it being dark it was hard to see what we had. The cottage itself was nice - small and basic, but all we needed for the weekend. We had a relaxing evening, playing cards, having a drink or two and generally getting in an island mindset. The view from the deck with the sunrise on Saturday morning. I was up fairly early, and got some work done while Justine slept in. As I was sitting at the desk overlooking the view above, I was very pleased to see a number of hummingbirds zipping around from the bushes near the house to the feeder the owners had hung up. It’s always fun to watch them flit about, but ti was distracting me from getting work done. I set-up my camera on the tripod and snapped some pics, any time the little guys sat still for more than a couple of minutes. The little female Anna’s Hummingbird that was hanging about. Bald eagle with a fish - a pretty big one! After Justine got up, we had some breakfast and walked down to the water. We soon discovered that there was a bald eagle sitting up in one of the trees, with a pretty big fish that he had caught. Not something you see everyday, so that was a good start to the morning. The direct beach access was nice, but there wasn’t a lot going on. So we walked up the road to Bellhouse Park and wandered a bit there. As always, there was interesting bird life about. A view of the water’s edge. The Golden-crowned Kinglet was checking us out. 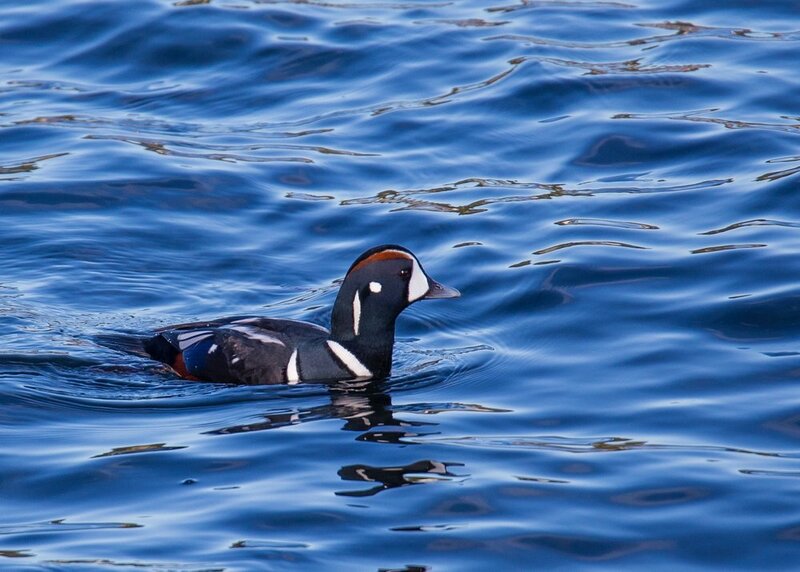 After coming back to the cottage, we went back down to the water to see what was going on, and discovered that there were some surprise visitors - my first Harlequin ducks! There was a little flock of them diving right along the shore, and despite the light not being great I did manage to get a couple of shots. And we had one lone harbour seal hanging out in the water off the shore by the cottage. We then headed up to the property and spent a bit of time doing some work. I bought a power trimmer, which we tested out clearing the brush along the top of the property. It’s going to need the blade I bought, as the standard wire got chewed up pretty fast. I didn’t have the tools to change it, so we didn’t last very long. A view from the property on a very nice November weekend. Around lunch time, we decided to hike down to the beach that is at the end of the trail that starts at the bottom of our property. It’s not a long hike, and goes through some nice forest before dropping down onto a rocky beach. Not surprisingly, we had the place to ourselves - except for all the little heads in the water that were keeping an eye on us. There were at least a dozen harbour seals, just floating a little ways off the beach. In addition to the seals, there were a bunch of sea lions that were patrolling a little further out. On top of that, there were some (I think) common loons that were floating about in the water. I think this is a female common loon. There was still some fall colour on the leaves down the beach. Sea lion coming up for some air. A view out to the mountains on the mainland. The seagull was having a hard time swallow his sea star lunch. The days are short this time of year, and after heading back up to the property for a bit, it was time to head back to the cottage to get cleaned up for dinner. As the sun set, the city gleamed across the water. As it was Justine’s birthday, I had managed to book as a table at Pilgrimme, rated one of the top 100 restaurants in Canada. I had actually made the reservation almost two months in advance - and got the last seat for the night. Dinner at Pilgrimme for Justine’s birthday. Dinner was amazing. The food, across the board, was unique, interesting and very, very tasty. 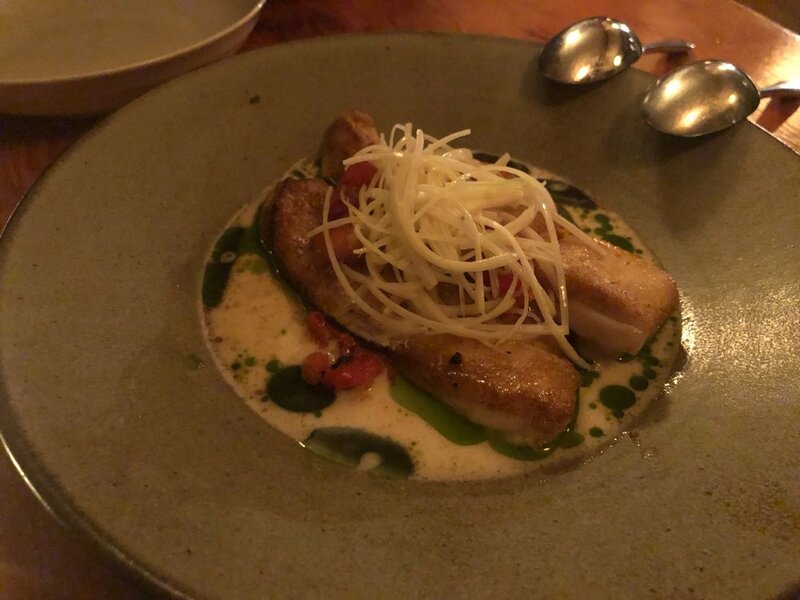 Most of it, frankly, was things I would never have ordered normally, and pushing the boundaries made us both try some new things that we were pleasantly surprising. It was one of the better meals I’ve had - and that’s saying something. After dinner, we headed back to the cottage and spent the rest of the evening with a bottle of wine, music and cards and had a lovely night. But damn that restaurant is good! Sunday was Remembrance Day, and we had discovered that there was going to be a ceremony up the road aways at the Lion’s Hall. We walked up a little after 10:00, and were well on time for the 10:30 ceremony. There was a good turn out - probably a couple of hundred people - and it was a nice multi-denominational ceremony. A very different day from what we normally do when we’re in Vancouver, but it was nice. After the ceremony, we walked back to the cottage and got ready for the day. 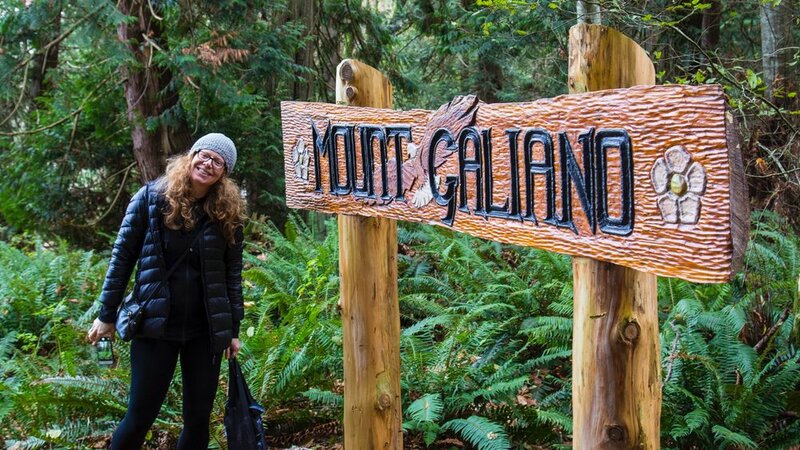 We decided to do the hike to the top of Mount Galiano, the highest point on the island. We were going to head to the property after, so we got everything organized and then headed out. The trailhead wasn’t far from the cottage, so it only took 10 minutes or so to drive over and park. At 311 meters, it’t not an epic climb, but we did have a very nice hike up through the forest. We didn’t know what to expect really, but with all the short hikes we’ve done on the island, this one again surprised us. It was a really nice little hike, and this time of year was brillant for finding all kinds of different mushrooms! Some teeny tiny mushrooms growing on the trunk of a tree. While all the different mushrooms on the way up were interesting (and took us a long time to walk a short distance), it was the views from the top that made the walk worth while. 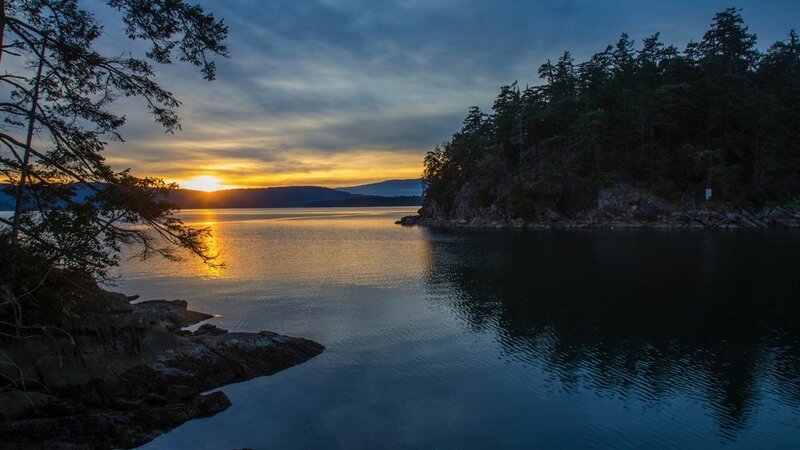 You have sweeping views out over the local Gulf Islands - Mayne and Salt Spring primarily, with some views out to the local mountains. We stopped for lunch on the top, then explored a bit before heading back down. After our little hike, we headed back to the car and then drove back up to the property. We spent the rest of the afternoon checking it out. We did some exploring in our little stretch of forest; walked the hill to see if we could start to form a plan for what we want to do with it; hacked out some broome to see how hard it is (answer - requires power saws) and generally enjoyed the afternoon, until the sun set and it was time to head back to the cottage. We went out for dinner, then headed back to the cottage and put on the fire. It was very nice to spend the evening in front of the wood stove, relaxing and playing cards. Monday morning I got up and did a call for work, and got a few pics of the male Anna’s Hummingbird that was hanging out the cottage. 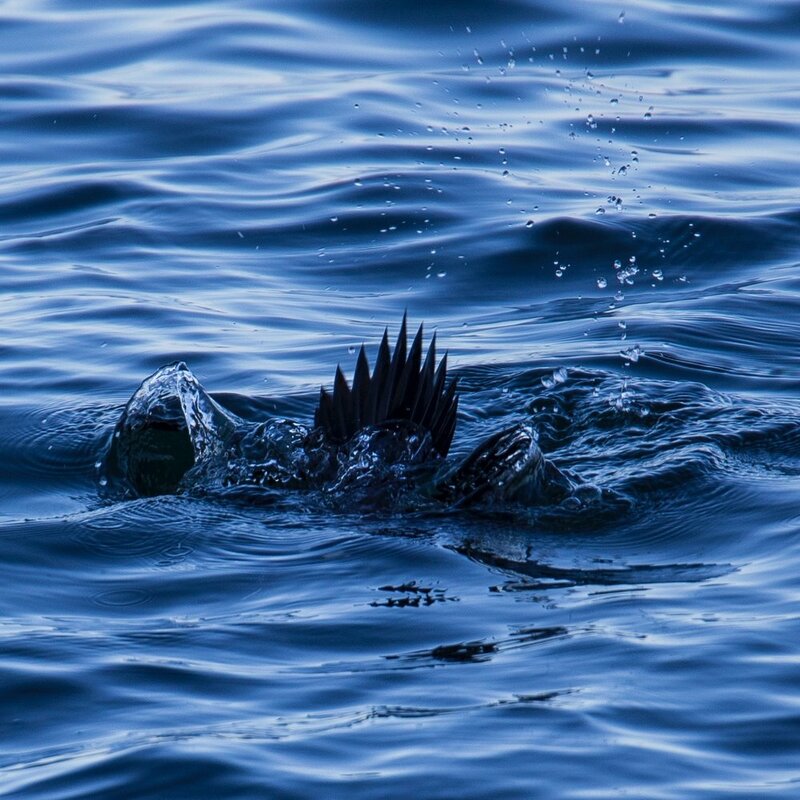 The sun was a little brighter, and his iridescent feathers really shone. 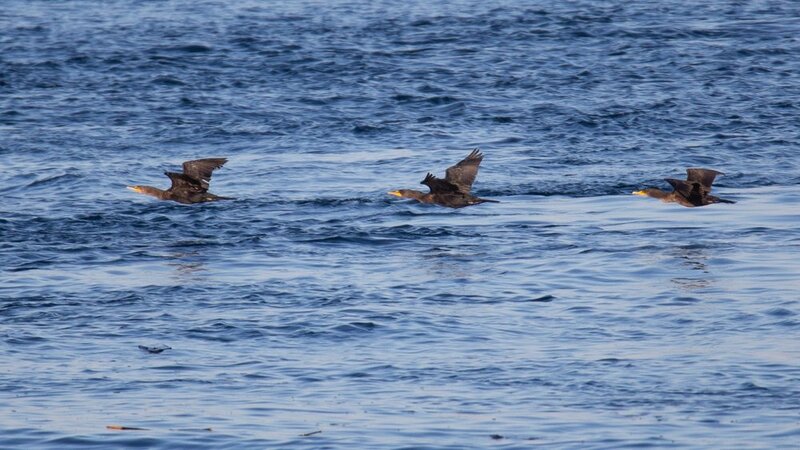 There were some flocks of diving ducks out on the water, and I saw some sea lions just off shore. As the morning looked really nice, I decided to g and play nine holes of golf on our little golf course. Once again, there was not another soul on the course, and I was able to play at my leisure. After golfing, I grabbed some breakfast and a coffee for Justine from the local coffee shop, then headed back to the cottage. The people that owned the AirBnB were nice enough to let us use it the whole day, so we were able to leave our stuff and go spend the day on the island. Our ferry wasn’t until the evening, so we had lots of time. We decided to walk down to Cable Bay, and see what was going on down there. As with everything we had done this weekend, we had the place to ourselves. During the summer, we had been swimming here. 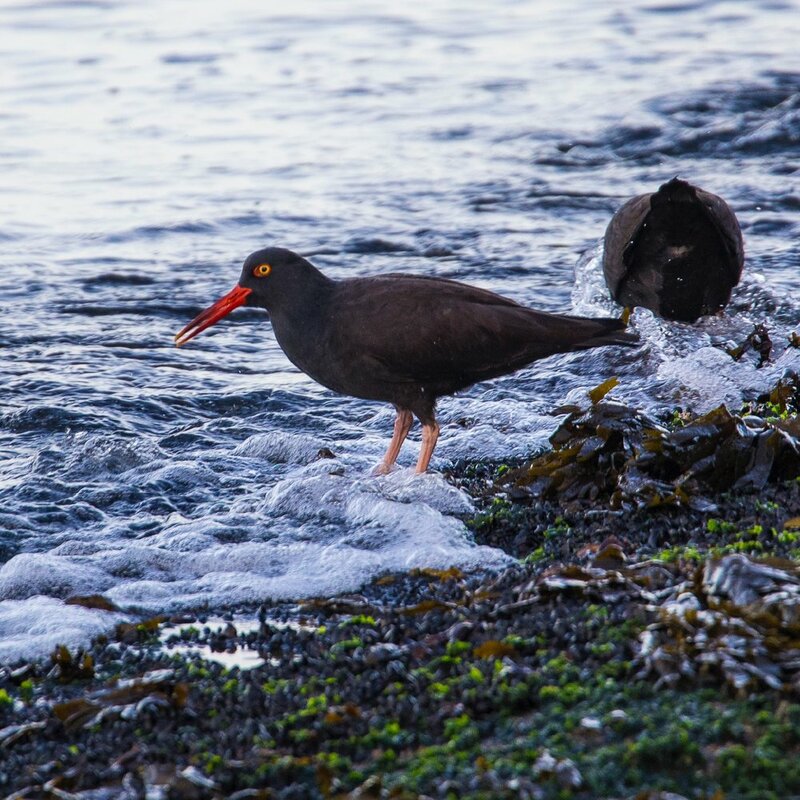 It was a little cooler now, but there were lots of birds, seals and sea lions once more. And great views of Mount Baker. A small flock of oyster catchers flew in while we were on the beach. We had some fantastic views of Mount Baker. As we walked back up to our car, we met up with one of our neighbours from the property. We had not met before, but he recognized us from our car and introduced himself. He was mountain biking, and it looks like he’ll be able to give us some good ideas on where to ride. We had a nice chat, and it continues a trend of our neighbours seeming to be really great! Before heading back for the ferry and dinner, we decide to head down to the dock near our place and try our hand at crabbing. We had bought some crab traps a while back, and it seemed like a good place to try. We cast out four times and caught 3 good sized red rock crabs. We could have kept them, but decided to send them back for next time. It was really more a test than to catch ones to keep. I’d say it was successful! As the sun set, we packed up and headed for the ferry and a late dinner.